Research emotions, personality for fiction through nonfiction. Researching a novel can involve more than history books, archives, and the other usual resources for honing details of terrain, lifestyle, time. What about describing emotions, personality, and the intangible nuances? The subject came to mind in riding along with a police officer on patrol. I asked the officer what resources she found helpful and that led to a conversation about lying. 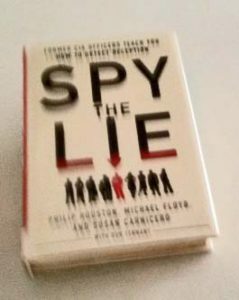 One book she found very useful, the police officer said, was Spy the Lie by Philip Houston, Michael Floyd, and Susan Carnicero with Don Tennant. The authors are former CIA officers who use a methodology developed by Houston to detect deception in the counterterrorism and criminal investigation realms. They show how these techniques can be applied in our daily lives. And in our writing, I add. I’m not going to go into the details of the methodology here, except to say that it focuses on a cluster of both verbal and physical cues. Length of time in answering, asking for clarification or sidestepping the question instead of answering with a clear “yes” or “no” are all clues to deception. Truthful responses tend to be direct and spontaneous, but deceptive people can mimic that behavior in responding to questions. The authors suggest ignoring what seem to be truthful responses and focus on the ones that may be deceptive. The list goes on. We’ve all seen politicians, TV and film characters, and fictional characters use these kinds of responses. Knowing about them gives us writers more possibilities as we frame a deceiver. In writing my book, Shadow of the Rock, my protagonist, a 20-some-year-old woman, goes sailing with a man she barely knows. He assaults her, but she attacks back and escapes. I used Gavin de Becker’s excellent book, The Gift of Fear, in developing the scene between the assailant and the victim. On a more positive note, I sometimes use the clusters of personality traits described in the Enneagram system or in the Myers-Briggs Type Indicator to define a character and its interactions.